Connor Young, 21, crashed his car into Barry and Jennifer Fleming's Audi TT near Falkirk. 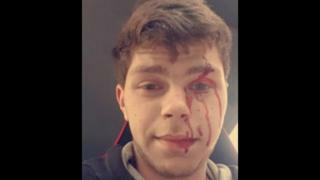 Young photographed himself in the driver's seat of his vehicle following the collision. Sheriff Simon Collins said it was "doubtful at best" that the Flemings would ever fully recover, and Mrs Fleming's injuries were "life changing". A trial at Stirling Sheriff Court was told the incident took place on the single-carriageway A803 close to the Falkirk Wheel in June 2017 as the couple headed back to Glasgow after a summer evening's drive. Mr Fleming said Young's car had appeared in front of him on the wrong side of the road. Mr Fleming said he managed to get out, and pulled his wife's door open. Sheriff Collins said: "It is surprising, perhaps extremely fortunate, that no-one was killed."